and so to improve function and therefore health. body itself creates to stimulate life processes. emotional change or other influences. detrimentally as a trauma and beneficially as a treatment. • increases cellular transport by 40%. Myofascial pain. This pain can be severe and long lasting. pain suffered by these people is often resistant to relief from narcotic pain relievers. What happens as a result of Microcurrent therapy? in response to muscle contraction and stimulates the break down of bone. diseases, including autoimmune diseases, insulin resistance, and cancer. nausea / vomiting and pain. syndrome, tinnitus, fibromyalgia, bipolar disorder, and anxiety disorders. 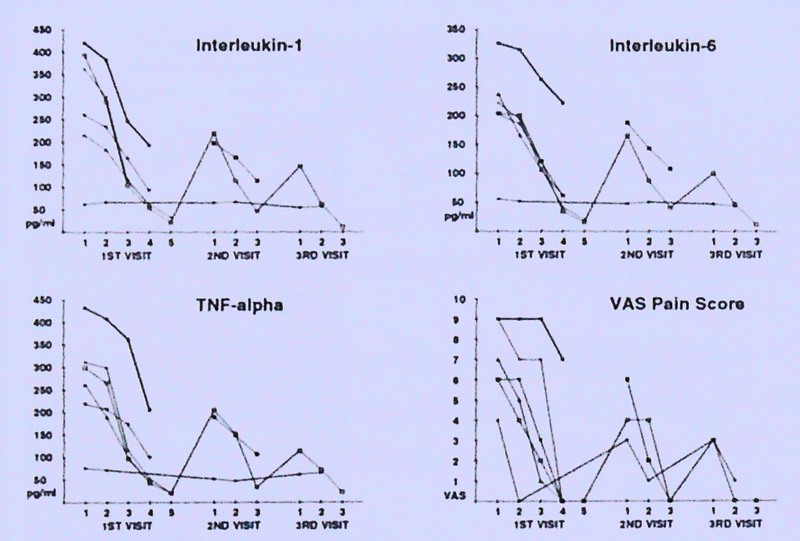 (refer to Table 1 & 2 above and “INFLAMMATORY AGENTS” charts). system recovers. Full recovery is achieved in most cases. system of its activity state. ovary can be increased by applying electromagnetic frequencies which amplify its activity. reduced activity and an altered life style. Josie (60 year old female active and fit – chronic knee pain leading to low back pain. range of movement. Joint movement is supposed to be limited by healthy ligaments. patient to x-ray radiation. Preliminary results with spines and pelvic joint motions are promising. Please note: If your ligaments are torn and not just stretched, then we will NOT see the changes indicated above. If there is a physical tear present, then it is likely that only surgery will help to repair the tissue. and the body's positional integrity depends on ligament soundness. extreme sensitivity to electromagnetic fields. treatment can however be used on locations away from the uterus. treatment is not an option for you. well. This would give them more energy to run more rampant. This is not a good idea! modalities. Instant relief is not routinely provided and it does take a number of treatments to achieve the levels of pain reduction shown in the tables above. Generally speaking "it won't hurt and it may help....."
a lot more stable than they were. He could do with another session. pain reduction on its own.